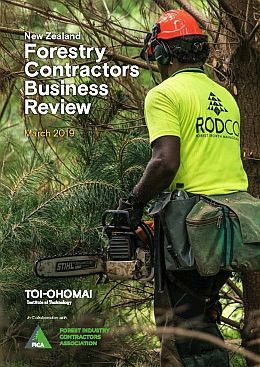 In this week’s issue we look at some results of a just completed survey of NZ forestry contractors. It’s comprehensive and represents the views of more than 115 contractor crews drawn from across the country. Attracting skilled workers and retaining existing workers has always been identified as a major concern to the future viability of contracting businesses. In this latest survey, it has also received top billing with 24 percent of those surveyed stating that the risk of losing key staff was keeping them awake at night. Results also highlight that few people are entering the industry right now and competition between crews is as a consequence, increasing. The full report is linked to the story in this week’s issue. In another project run last year by Safetree, health information has been collected from 774 forestry workers. For the first time, a snapshot on the health status of people working in New Zealand’s forestry industry has been provided. Sleeping issues were picked up again along with a number of other concerning health problems. The outcome here is that Safetree, and individual forestry companies, are now be able to develop targeted initiatives to reduce some of these identified health problems to ensure workers stay fit and safe in their work place. A video outlining a new tool developed by Dr Tom Mulholland, used as part of a 14-stop roadshow where Dr Tom talked to more than 1100 forestry people about how to improve their physical and mental health, is included in the story below. In tall timber this week, the first veneer-based mass timber panel in the world has just picked up U.S. and Canadian patents along with fire approvals to build up to 18 storeys high. In New Zealand, the Timber Design Society is proposing that carbon credits be paid to owners of new timber buildings, to recognise the value of the carbon stored in the wood, and to encourage the design of timber buildings using renewable materials. 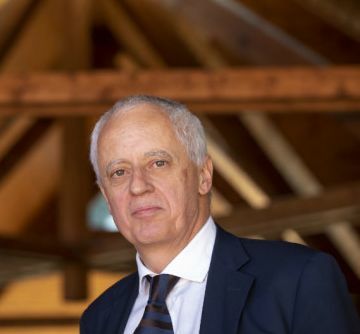 And fittingly, one of the very early researchers and proponents for CLT for tall structures is being recognised with the awarding of the 2019 Marcus Wallenberg Prize. This will to be presented by the King of Sweden at a ceremony in Stockholm planned for October of this year. 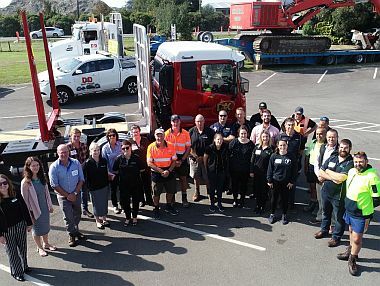 And finally, in Rotorua this week, the MobileTECH 2019 wrapped up yesterday. 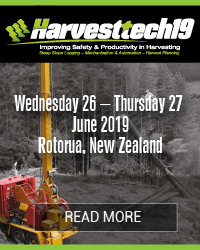 Close to 300 technology developers and early adopters of new technology from across the primary sector, including forestry, have been meeting in Rotorua over the last couple of days. Every year, results on a raft of new innovations being developed, adopted and used out in the field are discussed. As demonstrated by several case studies this year, the event, now well and truly established on the calendar for the country's primary sector, provides developers and researchers from around Australasia a unique opportunity to set up longer term strategic alliances across a number of land-based industries. It really has been an eye-opening couple of days. For those attending, details on access to the presentations given over the last couple of days will be sent out shortly. Enjoy this week’s read. Now, drones equipped with thermal imaging can find the koalas – and AI can identify the specific animal, to avoid counting it twice and provide greater insight into behaviour and health. “Effective wildlife management relies on the accurate and precise detection of individual animals. These can be challenging data to collect for many cryptic species, particularly those that live in complex structural environments. This study introduces a new automated method for detection using published object detection algorithms to detect their heat signatures in RPAS-derived thermal imaging. 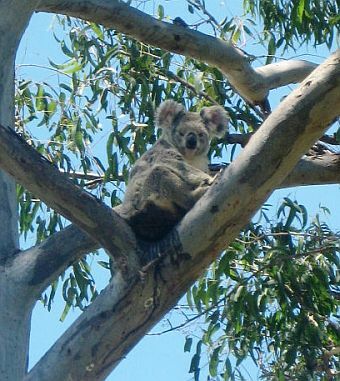 As an initial case study, we used this new approach to detect koalas (Phascolarctus cinereus), and validated the approach using ground surveys of tracked radio-collared koalas in Petrie, Queensland. The automated method yielded a higher probability of detection (68–100%), higher precision (43–71%), lower root mean square error (RMSE), and lower mean absolute error (MAE) than manual assessment of the RPAS-derived thermal imagery in a comparable amount of time. 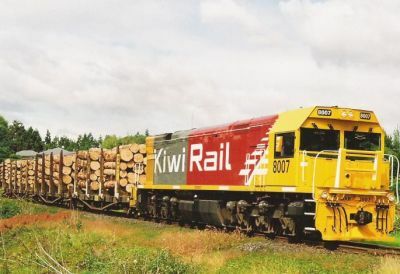 KiwiRail plans to increase its log capacity out of Wairarapa by about a third to cater for the increased harvest and reduce the number of trucks travelling into CentrePort in Wellington, New Zealand. The company runs two trains on week days – typically of 15 wagons each - and twice as many at the weekend when there are fewer commuter services. “We are planning to add 15 wagons to one of the daily trains in May, once more wagons become available,” he told BusinessDesk. “That will increase the capacity by around 100,000 tonnes a year from the current 270,000 tonnes” and reduce truck movements over the Remutaka Range by about 6,000, he said. Log exports are booming, with many ports working to increase capacity to handle trees planted in the 1990s. Logs and timber are the country’s third-largest export and brought in NZ$5.3 billion in the 12 months through February, 12 percent more than a year earlier. A new venture active this month wants to find ways to use that facility more efficiently. Forest Enterprises Growth, New Forests and Feilding-based FOMS have formed Log Distribution to better coordinate their shipments. The trio, some of whom also have operations around Gisborne and Rangitikei, are collaborating around their common interests in Hawke’s Bay and Wairarapa. Forest Enterprises chief executive Bert Hughes says recent changes mean all three firms are using Tauranga-based TPT to manage their export marketing and scheduling of their shipments. While they are still competing for sales, their logs are going on the same ships so they can work collaboratively to gather consignments and get vessels loaded quicker. “We expect to put 600,000 tonnes through Wellington” a year, he told BusinessDesk. “Once we get that right, we can grow it out from there.” Hughes is expecting a steady increase in the Wairarapa harvest during the next five years and CentrePort is expanding storage at Waingawa. Bert he said reducing ‘choke-points’ in the logistics chain will be key to making better use of the region’s rail and port infrastructure and reducing truck movements on the Remutaka Range, he says. Being “a bit more careful” about the grade of logs being cut may improve the use of space at Waingawa and increase stock turn, he said. Professor Gerhard Schickhofer from the Institute of Timber Engineering and Wood Technology at Graz University of Technology, Austria is being awarded the 2019 Marcus Wallenberg Prize of SEK 2 million for research and knowledge transfer behind the stable and eco-friendly material, Cross-laminated timber, CLT. Gerhard Schickhofer has also succeeded in transferring scientific knowledge to practical applications. His user-friendly software tools and handbooks have had a great influence in the field. The Institute of Timber Engineering and Wood Technology and the Competence Centre at the University of Technology in Graz also stand out by their application-oriented research. Both organisations provide the industry with technical support, testing and training. 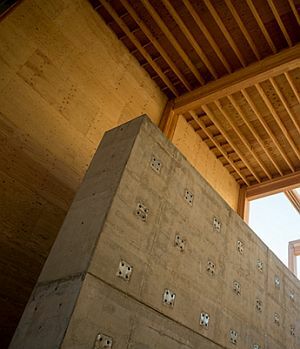 Gerhard Schickhofer’s passion and commitment to the field of CLT have played a key role in raising the profile of wood for the construction of massive and tall structures. His work has been seminal in interpreting the technological opportunities of CLT to architects and designers, says professor Johanna Buchert, chairperson of the Selection Committee. Passionate about lowering the environmental impact of the construction sector, structural engineer Adam Jones has been involved in a range of environmentally positive activities, including WoodSolutions. 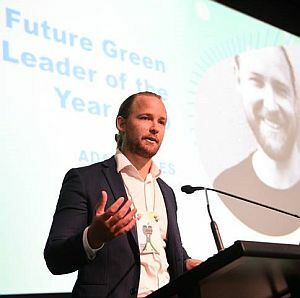 His work was recognised by the Green Building Council of Australia (GBCA) who named him Future Green Leader of the year at their recent TRANSFORM 2019 event. Recognising the effect that young professionals will have on developing a sustainable future, the GBCA created the Future Green Leaders program, which is available to all industry professionals under 32. As the Future Green Leader of the year, Adam will gain entry and access to a wide range of GBCA events, a speaking opportunity at Green Building Day and a mentor for the year. Adam explained what winning the title means to him. Before working with WoodSolutions, Adam was the lead researcher for strategy four, which was using timber, of the Rethinking Cement report, produced by Beyond Zero Emissions. The aim of the report was to demonstrate strategies that could reduce emissions associated with cement to zero in 10 years. Adam explained that while he was working on the report, he became far more aware of the environmental benefits of wood products and the activities of WoodSolutions and decided that he’d like to become involved. The company has also seen its product used in larger projects. Oregon State University’s new Peavy Hall, a forestry science center designed by Michael Green Architecture (a Katerra partner), featured Freres Lumber’s product on the roof, while the nearby A.A. “Red” Emmerson Advanced Wood Products Laboratory shows off the panels on its interior and exterior walls. Both buildings are part of OSU’s forestry complex, which is designed to display an array of new mass timber technologies. Freres also maintains a relationship with the TallWood Design Institute, a partnership between OSU and the University of Oregon, working with the institute to test its products. The company claims that MPPs have a number of benefits when compared to the cross-laminated timber products that have taken off in recent years—it was a CLT product that collapsed this past summer in the Peavy Hall Project, not Freres’s. Freres noted that MPPs offer better structural support and design flexibility. CLT can only be built out in orthogonal layers and is generally confined to standard lumber dimensions and shapes, whereas MPPs have greater flexibility in form and dimension (the panels and their thin veneer layers can be very small, but they can also scale up to as much as 48 feet long and 1 foot thick), giving designers and builders a greater range to work and experiment with. Prefab plywood panels are also an option, but they can easily be cut by a CNC machine to spec. 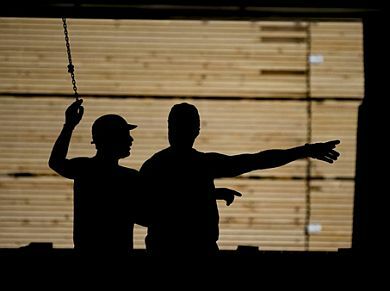 Photo: The mass plywood panel being used in construction at OSU's Advanced Wood Products Laboratory. Typical panel dimensions were 3 inch thick by 12 feet wide by 42 feet long. (Lauren Rennan/Courtesy Freres Lumber). The New Zealand Timber Design Society (TDS) is proposing that carbon credits be paid to owners of new timber buildings, to recognise the value of the carbon stored in the wood, and to encourage the design of timber buildings using renewable materials. The TDS Management Committee is promoting this incentive in support of the government’s One Billion Trees programme to encourage more forestry on marginal lands, and the Zero Carbon Act to reduce the use of fossil fuels. Both initiatives rely on carbon sequestration in forests, and both can be enhanced by encouraging low carbon timber buildings. Such timber buildings will keep more New Zealand grown wood in the national economy, rather than exporting logs overseas. As trees grow, the process of photosynthesis absorbs carbon dioxide (CO2) from the atmosphere, and carbon is stored in new wood. When trees are cut down, the sequestered carbon stays in the wood and wood products for some time, extending the life of the pool of carbon. The wood components of a new timber building can store significant amounts of carbon for hundreds of years, until the wood eventually decays or is burned. The eventual goal must be to phase out fossil fuels, because this is the only long-term way to achieve a zero-carbon economy. Forestry is a short-term step to buy time as larger steps are implemented. According to Dr Andy Buchanan, Professor Emeritus at the University of Canterbury, new forests on unforested land are needed to increase the pool of carbon in New Zealand’s forests. These new forests can be permanent forests (mostly native), or managed forests (mostly exotic). In permanent forests, the amount of sequestered carbon levels off as the forest matures, eventually reaching a steady state. In forests managed for wood production, the amount of sequestered carbon rises and falls during forest rotations, with the average long-term pool about half that of a permanent forest. To enhance the carbon benefits of forestry, the owners of new buildings should be encouraged to use wood rather than traditional structural materials. A financial incentive could be based on credits for the carbon stored in the wood, paid to the building owner. The benefits of low carbon construction can be quantified. About half the weight of dry wood is carbon, so one cubic metre of wood which weighs half a tonne (500kg), sequesters a quarter of a tonne of carbon (250kg). This is equivalent to almost one tonne (920kg) of carbon dioxide (CO2) in the atmosphere. Carbon credits and carbon taxes are usually related to equivalent tonnes of carbon dioxide, not to tonnes of carbon. A typical 200 m2 timber house contains 30 cubic metres of wood, and stores carbon equivalent to 27 tonnes of CO2. The three-storey NMIT Arts and Media building in Nelson contains 460 cubic metres of wood and stores 425 tonnes of CO2. With carbon credits trading at $20/tonne, the building owner would have received a modest cash incentive of $8,500. Dr Buchanan suggests that the incentive should be a one-off cash payment to building owners at the time of construction, because a single payment for selected timber buildings is much easier to administer than a long-term compliance system for all wood users. In Hamburg, Germany, for example, building owners receive €0.80 for each kg of timber used in new commercial construction. 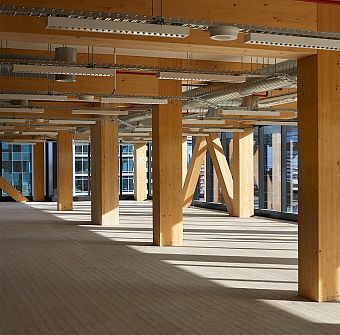 Structural timber is beginning to compete worldwide with steel and concrete in attractive and functional new buildings, with no increased cost and similar or better safety and performance. The New Zealand construction industry has been slow to adopt new timber technology. Even a small financial incentive based on carbon credits could make a difference. The main markets are commercial, educational, and cultural buildings, as well as offices, hotels and apartment buildings up to 10 or 15 storeys tall. Some timber buildings contain many hundreds of cubic metres of wood. A further benefit of timber buildings is that wood processing is carbon neutral. The manufacturing processes for materials like steel, concrete and aluminium pump large amounts of CO2 into the atmosphere. Many building owners are looking for green, renewable, and low carbon construction. Even a small financial incentive may tip the balance towards timber. The benefit to the government will be a small but significant contribution to the national carbon budget. Sustainable timber construction will provide many other benefits of to the national economy, including more forestry jobs, more local wood processing, and regional development. Södra’s pioneering Act of a Hero campaign was named Marketing Campaign of the Year at the PPI Awards in Vienna. Linda Ottosson, Head of Marketing Communication, who led the campaign with Sales Director Marcus Hellberg, accepted the award on behalf of the Södra Cell team, along with Customer relations Manager, Angeline Elfström. “We’re extremely proud of the pioneering Act of a Hero campaign for several reasons,” she told the audience. Southland students have been encouraged to become the future of forestry. To coincide with the UN International Day of Forests, a forestry careers day was held on Thursday 21 March to introduce students to the many varied jobs available in forestry in Southland, New Zealand. Students were able to learn about the harvesting, management, environmental and new technology aspects of forestry from speakers from Rayonier Matariki Forests and City Forests, and speak with industry experts about career pathways and job opportunities in the sector. An informal expo setting also allowed students to watch a drone demonstration, experience a forestry harvesting simulator and inspect and handle items ranging from chainsaws to seedling trees. The industry people who participated enthusiastically and gave up their time for the day and organised machinery and trucks to be there were; Rayonier Matariki Forests, Niagara, Ernslaw One, CH Faul, Lawson Forestry, Competenz ITO, Mike Hurring Contracting, City Forests, Craigpine, DT King Transport, Sparrow Logging, South Port, Edendale Nursery, Forest Management, D&D Heavy Haulage, and Venture Southland. Additional photos taken during the day can be viewed on the Southern Wood Council website. The Chief Executive Officer of the Australian Forest Products Association (AFPA), Mr Ross Hampton, has been reappointed for a third consecutive term to the international body which advises the Food and Agriculture Organization (FAO) of the United Nations on matters relating to sustainable management of forest industries globally. Mr Hampton sits with representatives from: South Africa, Canada, USA, Brazil, China, New Zealand, Argentina, France, Germany, Japan, Korea, Russia and several other countries. “The Intergovernmental Panel on Climate Change (IPCC) provides the overarching approach which is promoted by global leaders who care about the environment and about sustainably using the earth’s resources as we battle the effects of a changing climate.” The IPCC stated (4th Assessment) - “A sustainable forest management strategy aimed at maintaining or increasing forest carbon stocks, while producing an annual sustained yield of timber, fibre or energy from the forest, will generate the largest sustained (carbon) mitigation benefit”. One of New Zealand’s largest independent forestry service providers, FOMS, has today announced the rebrand of its operations to Forest360. Since its formation in 2004, the privately-owned company has become one of New Zealand’s largest independent log procurement, harvesting and marketing service providers, with forestry operations spanning across the North Island. Safetree ran a project last year to find out about the health of New Zealand forestry workers. The goal was to identify what health risks need to be managed to ensure forestry workers stayed fit to do their jobs. We also wanted to give people a better way to monitor and manage their health. -	23% were at risk of moderate to severe depression; 4% screened positive for severe depression. Safetree are suggesting that you might look to build in Dr Tom’s TWIG video at your next off-site safety meeting. In comparison to this time in 2018 — when all lumber markets were active and it was supply that was the constraint — the situation in 2019 is quite the opposite. When we look at the key global producing and consuming markets, there is a consistent theme: too much supply chasing markets amid slowing demand in most major markets. Whether this is temporary or not is a big question that will be answered shortly by the fast-approaching spring buying season. A quick look at the key countries, gained through recent travels by the FEA team, offers the perspectives summarized below. China: As reported in this month’s China Bulletin, log and lumber inventories are soaring and getting close to the levels achieved in early 2015 that set the stage for a price collapse both in China and around the world. All exporters need China to take either the low- or furniture-grade lumber that is incremental to other markets. For example, when U.S. markets for SPF #2&Better lumber collapsed in the fourth quarter of last year, B.C. mills diverted volumes to China. The consequence of that action has been a glut of SPF lumber at Chinese ports. Finland: High cost logs are an overriding issue. Among other challenges, exports to China have slumped by one-third, and other markets are not as robust as last year. Sweden: Despite some favourable operating and logistics costs, Sweden may see lower sawnwood prices in Q2 versus Q1, for only the second time in 20 years. Export opportunities to the U.S. and China have slowed, with margins much thinner than in 2018. Germany: With a huge spruce bark beetle outbreak and vast areas of storm-felled timber, German sawmills in the affected areas (as well as Czech and Austrian mills) have low-cost logs; however, they need markets that will accept blue-stained lumber. Australia: A slight slowdown in the housing market has combined with rising lumber inventories to keep lumber prices holding for now. European imports have surged, but this is not well timed to the current market situation. Australia’s acceptance of blue-stained lumber has led to an increase in import volumes from Germany. U.S.: So far in 2019, winter and/or rainy weather have slowed homebuilding activity, leading to some inventory buildup at mills. However, while dealers’ inventories are reported as high in weather-constrained areas, they are low in most other regions. This situation could result in a surprise price spike in Q2/2019 given the number of sawmill curtailments witnessed in Q1. A fire high in the mountains of western China's Sichuan province has killed 30 firefighters and others, the government said on Monday. The deaths occurred after a change of wind Sunday as the firefighters were battling the blaze in a rugged area at an altitude of 3,800 meters (12,500 feet), according to the Ministry of Emergency Management and the military. Among the dead were 27 firefighters and three local residents recruited to help fight the blaze, the ministry said. Nearly 700 people were battling the fire in Sichuan's Muli county that erupted on Saturday, but contact was lost Sunday with the 30. Two helicopters carrying medical staff and military personnel were dispatched to help in the search. 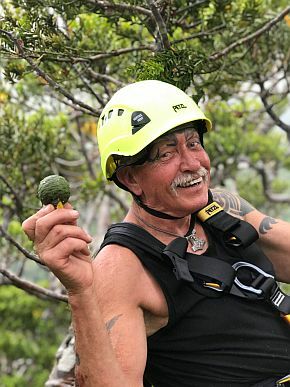 One of the biggest kauri seed collections to be undertaken in decades is happening now across the upper North Island of New Zealand in an effort to identify trees that are resistant to kauri dieback. The seed collection is part of the Scion-led Healthy Trees, Heathy Future (HTHF) programme focused on researching and combating several Phytophthora species, including Phytophthora agathidicida aka kauri dieback. Mana whenua groups involved include Omahuta, Ngamanawa Inc, Te Roroa, Te Rarawa, Patuharakeke, Tau Iho I Te Po, Te Rawhiti, Ngati Huarere Ki Whangapoua, Te Uri o Hikihiki, Ngati Hine, Ngati Rehia, Te Uri O Hau, Kawerau a Maki and others. Kauri seed is enclosed in cones that mature between February and April. Maturation is earliest in Northland and then moves south. "Uhhh, I'm like you, just travelling!" "No.......I'm a little busy right now!!!" "Listen, I'll have to call you back. There's an idiot in the other stall who keeps answering all my questions. One more for you at the end of the week to get you thinking. Did you know that if you replace "W" with "T" in "What, Where and When", you get the answer to each of them.